TCB try a remake, but that wasn't a magic part from them. yeah! the original multiscroll intro, a part of demo culture ! an exploding firework of scrolltexts in all speeds and colors, zooming flying logos and balls. The big scrolltext was mande of rotating letters and almost unreadable;-). Any1 for a remake ? Punaise, elle ma trop démonté cette démo là ! To anyone who doesn't want to bother counting, I counted 48 rows of scrollers. Plz: give a link here if you know a demo such as said bigcheese. For me this one is the ultimate Spreadpoint intro. Scrolls rule :) Very neat too. I was blown away by this! True demoscene classic. 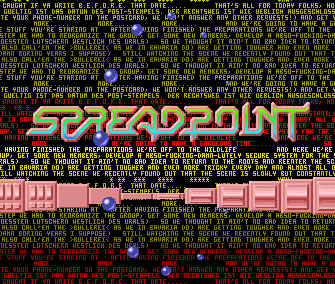 Fast, unreadable and filled with an overdose of animations : a true pure genuine demoscene product. Rulez of course. How could I forget to give a thumb up to this one?! I loved that ruling thingy. I love this one, remembers me to the old times. Mark, do you still have the sign from the station??? Hope to see you soon in Berlin! rulez added on the 2013-08-29 18:07:31 by ɧ4ɾɗվ. page created in 0.018850 seconds with 15 queries.